Note: This system only works for simple chain drives, as with singlespeed /fixed-gear bikes or bikes with internal gear systems. It does not work on bikes with derailer gearing . 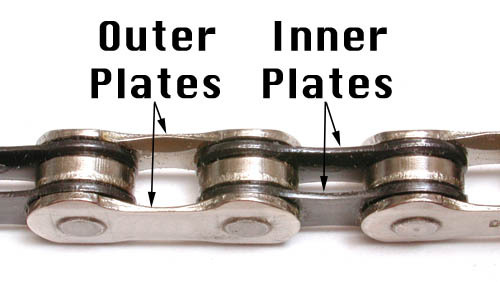 As a chain wears, it elongates, but the elongation only happens between the rollers separated by outer plates. Those roller pairs are held apart by the moving pins and bushings/plates, so as these parts wear, the distance between the centers of these rollers increases. The roller pairs connected by inner plates will always maintain the original 1/2" center to center distance no matter how much the chain wears. Although all of the rollers, and the inner plate projections that locate the rollers wear, the wear is basically the same for all of the rollers, so the center-to-center distance doesn't change on the rollers connected by inner plates. As the chain wears, it deforms the sprocket teeth to match the increased pitch of the worn chain. On an odd numbered sprocket, each tooth is alternately in contact with a "stretched" half link and a normal-pitch half link, every other revolution. The "stretched" half links deform all of the teeth, which then no longer mesh properly with the un-stretched half links. With even numbered sprockets, only the teeth that correspond to the "stretched" half links get deformed, and by doing so, they work fine with the elongated half links. The alternate teeth don't wear as much, since they are dealing with normal pitch half links. If you have a simple (non derailer) drive train with even numbered sprockets, you can considerably extend the lifespan of the drive train components by paying attention to the "phase" relationship of the chain and sprockets. You need some way to keep track of which sprocket teeth have been running between inner plates and which have been running between outer plates, then make sure that every time the chain is removed for service it goes back with the same pattern. Since sprocket teeth tend to look pretty much alike, it is helpful to have some way of marking them. One way to do this is to use a grinding wheel to grind off the point of just one tooth. This would be a tooth that will be fitting between outer chain plates. Since the outer plates never actually touch the sprocket, the missing tooth point won't increase the risk of chain derailment. See also my General Chain Wear Article.